I put some pics of a gun we built with one of the new Troy MRF rail that was anodized in tan. SEE HERE. Just built anothr for a guy with the 9" rail the other day and it is equally as impressive! Gun is using a RRA lower with Stag upper. One of Denny's 18" barrels (I dont know which, the customer provided it, sorry for the lack of specifics Denny) with the new Troy MRF-M in tan, a tan Vltor stock, Tango Down grip, LaRue gas block, Vortex flash suppressor, LaRue SPR mount and a Leupold LR/t M1. Wow... that looks pretty good. 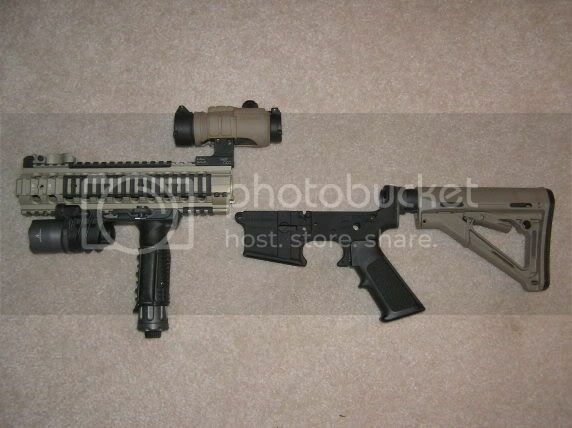 How does the troy FDE match up to the Magpul stuff? The best optic/light/forend cannot make up for a barrel. What upper/barrel are you planning for this build?